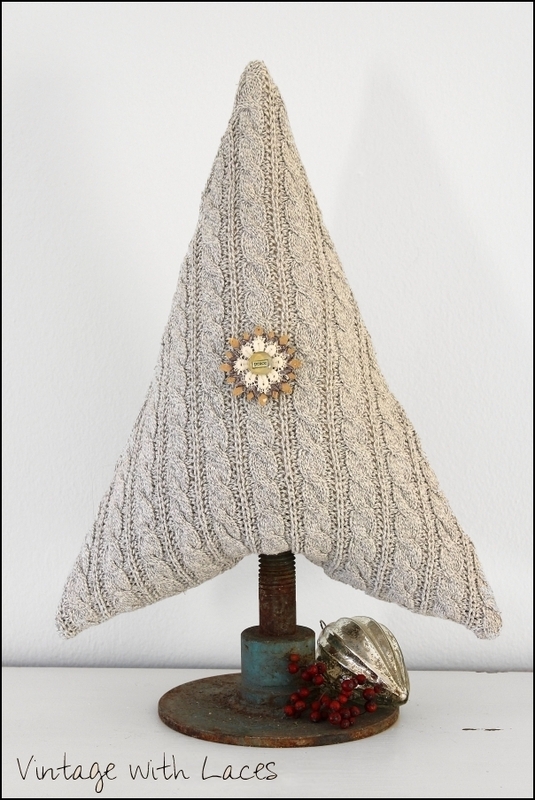 When my husband sorted out a cotton sweater with a cable pattern, I cut it up and put the pieces in my fabric stash with the idea to make sweater trees for Christmas. 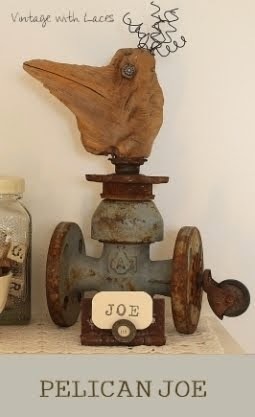 Some weeks ago I rummaged through a box filled with rusty parts and found the perfect tree trunks for this project. I dyed one piece of the sweater in a medium gray because I wanted the trees to look a bit different. 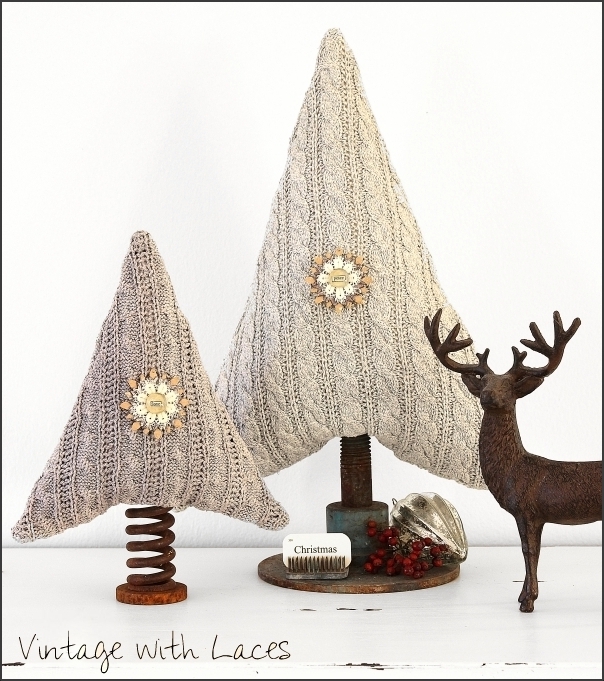 Additionally, I used the left side instead of the right side of the knit fabric for the smaller tree. To give the trees a certain stability and to prevent the fiber filling to poke through the little holes, I sewed inlets from heavy weight muslin first and covered them with the sweater material. The Christmas ornaments I used to embellish the trees, are a few years old. I made them from star-shaped thread cards, a bit of paint, pieces of lace and glass cabochons. I keep my Christmas decoration rather simple this year and I love it. I’ve sorted out and given away a lot of Christmas ornaments and other décor pieces. My taste has changed so much and I had been in a serious decluttering mood. Almost everything super cute has left the building. Has your Christmas decoration style changed as well over the last few years? and the beautiful ornament. Love the display, with the deer , and old books from Germany . Yes I can see you have changed style a lot, since parting from Germany, more neutral, more "simple" but looking gorgeous ,too. I have to admit I`m still with the glitter for christmas,lol, and doubt I will ever change, but I love your creations I have seen this last year . I hope all is well, and send you big hugs and much love. Love the sweater trees! So pretty, soft and eye-catching! these are so charming and pretty. I love everything about this post.. such an inspiration! Christmas joy to you. Love it!!!! You are so creative and talented! Oh, yeah, I've been decluttering too . . . YET I still seem to have STUFF!! I thought I'd keep my decorations simple this year as well but it still seems I put out a lot but definitely less than in the past. I too have gotten rid of a lot of my Christmas decor, style changes, although I keep some things "traditional" because of hubby! Awesome trees, my talented friend!! Julia, you are amazing. What imagination. Love these trees. These are adorable! My Sister is a BIG knitter and she would love these. 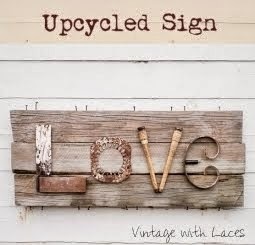 As well as cleaning out some closets, it's a wonderful way to recycle what you already have... great idea! Oh my gosh these are so sweet. You are so creative. Just love these cute sweater trees. Wow these tree's are amazing! I love how 'simple' but so creative they are; up-cycled to boot! how cleaver to reverse the fabric for the other tree for such a different look. I'm just in love with the little snowflake ornaments. How do you dream up these ideas? Wow, these are so charming! Love the bases and the extras you added. Great job!! Oh, I absolutely adore your Christmas trees, dear Julia. You are simply amazing, my friend:) Have a wonderful upcoming weekend. Beautiful work, love it ALL! If you have a few moments to share a few more details it would be great to know the rough dimensions of the trees--or at least height--and what technique you settled on to attach or stabilize the trees to their rusty hardware trunks. Merry Christmas and happy new year filled with all the making and creating you desire! these are great - simple but sophisticated! I've keep decorating pretty simple myself this year...seems to be the mindset of many...enjoy your holidays Julia! ich bin HIN UND WEG! Das ist die süßeste und hübscheste DIY-&-Recycling-Idee, die mir zu Weihnachten je untergekommen ist! Und ich hoffe doch SEEEHR, dass du sie im Jänner, wenn dann meine neue Aktion startet, dort noch verlinkst! So, wie ich überhaupt hoffe, dass du dich daran häufig beteiligen wirst, schließlich wird "neues Leben für alte Sachen" eines der Teilthemen dieser Aktion sein! ich bin immer wieder total erstaunt, was für Ideen du hast und wie du sie umsetzt. Ich wechsle auch immer wieder gerne meine Weihnachtsdeko aus. All zu viel verwende ich nicht, aber ein bisschen darf es schon sein. I have fallen in love with those trees and such a clever idea to re-cycle an old sweater into the most beautiful and unique up-cycled Christmas trees and the springs work so perfectly with the style. The decorations are the cherry on the icing on the cake!!!! Your home must be brimming over with the most special of festive decorations. This is one of my favorite Christmas projects that I have seen this year! Thanks for sharing. These are so pretty and VERY classy. My kids are all almost grown but sadly they still won't let me get rid of anything in the way of decorations that they know and love. I'm thinking when they all finally leave home maybe they can take some of the cutesy stuff with them and I can have something sophisticated and colour co-ordinated! Love your tree Just adorable! I have to say I just LOVE your recycled cable sweater Christmas trees with your rusty stems. The reindeer and book props are so perfect to display them. I too have a less ornate vignette this year in keeping it simple but still with some of my loved ornaments. Thank you for supporting Liz's Animal Rescue Centre auctions. She has been so generous in offering so many wonderful French vintage items to this end!Love the collage you created to advertise it also. Love and hugs to you dear friend and hope you are doing well as you declutter as I too am doing here! That's a brilliant idea! You've made my day by these lovely trees! The words of wishes are also to the point. Thanks for sharing! 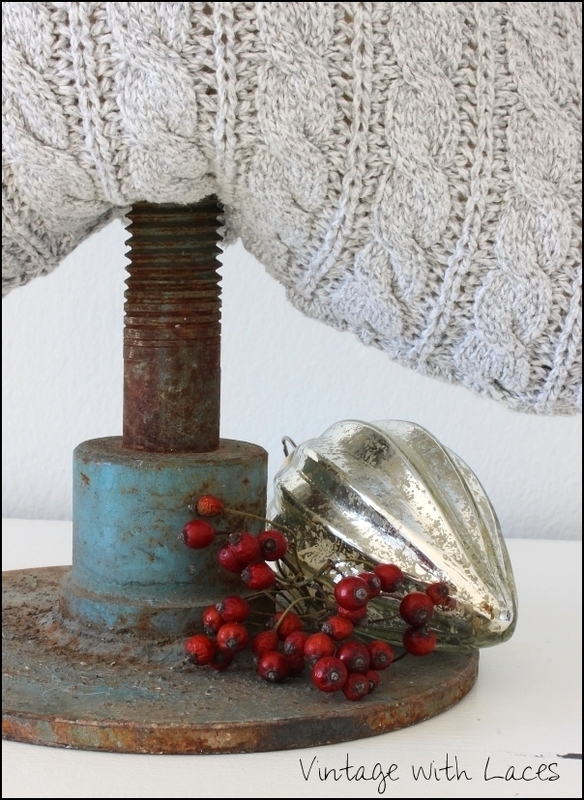 The sweater with the rusty parts are a perfect match! I love your ornament embellishment too! Yes, my taste in Christmas décor has changed dramatically and I want to get rid of all the cutesy stuff too! I tend to decorate for winter more so I can leave it out till March! Julia, the trees are fabulous but I am especially taken with the ornaments--gorgeous for any time of the year! Thank you for sharing @Vintage Charm! Merry Christmas! Hi Julia, I am absolutely in love with this idea. What a terrific way to repurpose an old sweater. Thank you so much for linking up at Create • Share • Inspire. I hope to see you back tonight! COMPLIMENTI ...crei delle cose bellissime, hai delle idee sempre nuove!!! E' sempre bello vedere i tuoi post!!! Your Christmas trees are just beautiful and gorgeous. such a stunning design with the fabric. I hope you are alright and i wish you a Merry Christmas and a happy new year. The sweater trees are so adorable. I like how you paired the sweaters with rusty metal. ich hab da mal eine Frage: Ich "bastle" nämlich gerade an meinem letzten Posting vor Weihnachten, und da möchte ich u.a. natürlich auch zeigen, womit du mir eine große Freude bereitet hast. Und wenn du nichts degegen hast, dann würde ich in meinem Beitrag auch eins deiner Fotos aus diesem Post hier zeigen, weil die, die dich noch nicht kennen, dadurch einen Eindruck von deiner Kunst bekommen und weil ich sowieso ganz vernarrt in den Anblick deiner speziellen Bäumchen bin. Deswegen meine Frage: Darf ich? Wow has my style changed...I got rid of everything pink and lacy,,,yep, tastes have changed a lot! 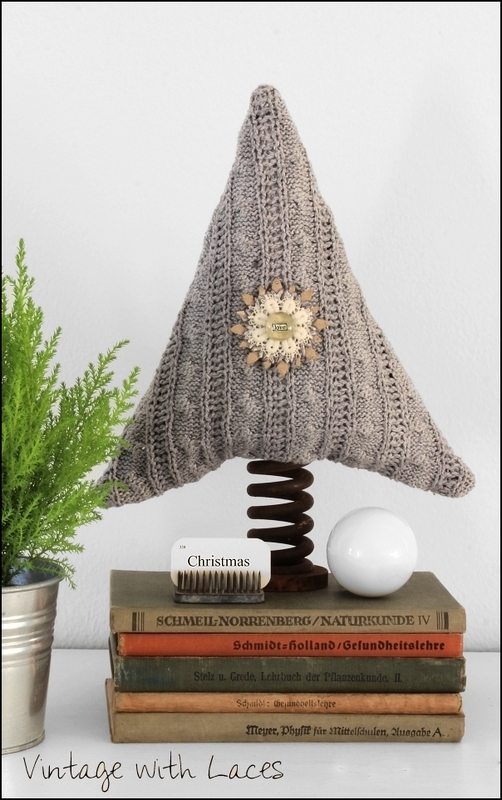 I have never seen sweater trees, seldom do you see a new and adorable idea on the web! I love the look! WOW,the imagination you have, you create such beauty with such simple objects. Brilliant, Julia! Oh Julia, I LOVE your sweater trees! What a creative soul you have. The way you fashioned them with those rusty tree trunks---LOVE IT! A beautiful addition to your Christmas decor my dear. Thank you for your lovely comment. Seeing you had stopped by was such a joy! I saw the trees at the My Salvaged Treasures party and had to come over for a closer look. They are gorgeous. Happy holidays. These are adorable, Julia!! I think I have some old sweaters around here, I will give it a try. Thanks for the inspiration and Merry Christmas! What a fabulous idea!!! So chic and adorable!!! Thanks so much for sharing!!! Happy New Year!!! Liebe Julia, diese Bäumchen sind wunderschön. Mir gefällt die Mischung aus romantischem und industrial. Tolle, was man alles aus gebrauchten machen kann. Die Ornamente sind auch sehr schön und bestimmt flexibel verwendbar. Dear Julia, i like these trees, these combination from romantic and industrial style. Its fantastic, what you creat from used things.